Smart advices for Montreal visitors. Best restaurants, shopping spots and things to do in Montreal are listed. All the people who saw Montreal once in a lifetime agree all on hands saying that there is something with this city that makes it irresistible. However they cannot name it. We will try to explain this addictive city of Canada's charming points so that you can try to name what makes it so seductive. The perfect blend of skyscrapers, historic squares, churches and cathedrals, vast parks and botanical gardens, classy bars and restaurants and water canals might define Montreal, Canada's most charming city. The dynamic social life reigns in this bilingual city and you can come across large scale festivals in any time during the year. Art and culture oriented Montreal never gets tired of surprising you. World famous jazz festivals, wall paintings, theatre shows at the parks are only some of the attractions of the city. This European faced city of Canada takes you in with its cosmopolitan social structure and the privileged, free spirited people of the city will surround you with all their hospitality. With its historic texture, narrow backstreets, cozy yet chic cafés and French speaking people, the city is also known as “Paris of Canada” and just cannot wait to entrance you too. Being the largest city in the province of Quebec, and the second largest city in Canada, Montreal is located in the southwest of Quebec. Canada's 3rd busiest airport, Montreal (Pierre Elliott) Trudeau Airport is located approximately 20 minutes away from the city center. For the detailed information about the transportation alternatives from the airport, you can visit the official website of Trudeau Airport. 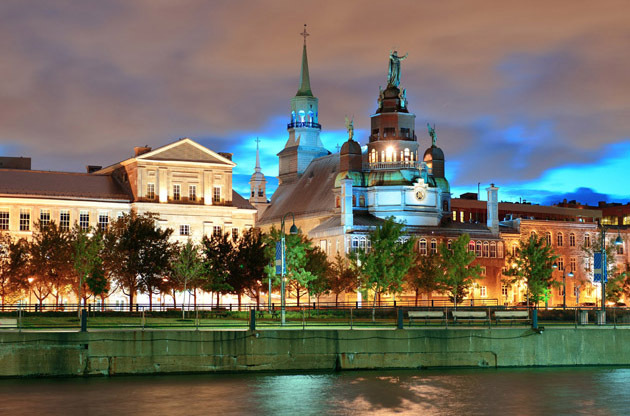 Montreal’s old town, Vieux Montreal is the address of the many historic and touristic attraction landmarks of the city and your trip will not be complete without visiting this district. Combining Neo-Gothic style with Canadian architecture, Basilique Notre Dame is fascinating with its gigantic bell and a woodworking masterpiece Chapelle du Sacré-Coeur. If you like to witness the 600 years old history of the city, one of the oldest Catholic cemetery and aqueducts, this history and archeology museum will attract you. The museum offers you huge collection of the pieces that exhibits the history of Montreal and the North America. What you will find inside are archeological remains, historical documents, uniforms and medals, books, photographs and so on. This is a rich city in festivals and cultural activities. In any season, you can catch numerous remarkable event that will delight you. Take a look at our recommendations. If you are in Montreal in autumn, you are so lucky to catch the biggest jazz festival in the world! We ensure you that you will have enough of jazz, blues and more during 11 days. During the summer, parks in the city become the addresses of free Shakespeare plays. You can follow the schedule from the website of the Shakespeare-in-the-Park event. In winter too, this city has a festival to offer you. In this festival there are many indoor and outdoor activities, performance arts and DJ performances. Being a classy area and a tourist attraction center, there are many urban chic cafés, bars and restaurants in this street. Presenting you a stunning view of Vieux-Port, Casino de Montreal is home to many shows and eating options. One of the most remarkable jazz club in the city, Upstairs is also the host club to Montreal Jazz Festival. Using always the freshest and the high quality ingredients, Milos is a remarkable Greek restaurant that serves seafood generally. This restaurant serves so fresh fishes that you might think they are alive! Known for its finger licking oysters and sushi, Kaizen deserves your visit. For 20 years, Buonanotte remains as the city’s most attractive Italian gourmet restaurant with its stylish design, great music and delicious wine. Being the address of the many popular boutiques of reputable designers, souvenirs shops and artistic activities, Marché Bonsecours is so popular in Canada and a must-visit stop in the city. Known as the Canada's Champs-Élsyées, you can follow the latest trends in fashion in this classy streets. How does it sound to you to shop at the basement floor of a church? If your thoughts are positive, get ready to shop from this cathedral that has 75 fascinating stores. If you view the city from another angle, boat trips will be the best option for you. You can have detailed information about the dinner cruises and other kinds of boat trips in Vieux-Port. Montreal is a unique city thanks to its multi-lingual environment, great cuisine, fascinating architecture and essences of European history and culture. Creating a matchless atmosphere for international events like conferences, congresses, symposiums, fairs, exhibitions and tradeshows. Experienced as a host city of large scale global gatherings, the city's physical facilities are also favorable. Having world class hotels, convention and exhibition centers equipped with the latest technology, Montreal makes one of the most attractive centers for these kinds of events in Canad and in North America.